The Society has many awards, please click on one for more information. This is the highest award of The Micropalaeontological Society. It is named in honour of George Stewardson Brady (1832-1921) and Henry Bowman Brady (1835-1891) in recognition of their outstanding pioneering studies in micropalaeontology and natural history. The Medal is awarded to scientists who have had a major influence on micropalaeontology by means of a substantial body of excellent research. Service to the scientific community may also be a factor for consideration by the Award Committee. 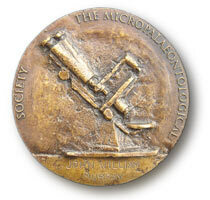 The medal was commissioned and was awarded for the first time in 2007 to Prof. John W. Murray. The Medal is cast in bronze from original sculptures commissioned by The Micropalaeontological Society in 2007. The sculptor is Anthony Stones, Fellow of the Royal Society of British Sculptors and President (1999-2004) of The Society of Portrait Sculptors. The Medal is hand crafted by the leading sculpture foundry Pangolin Editions of Chalford, England. 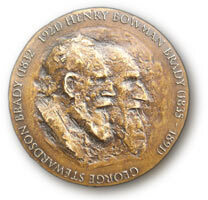 The Brady Medal is cast in bronze from original sculptures commissioned by The Micropalaeontological Society in 2007. The sculptor is Anthony Stones, Fellow of the Royal Society of British Sculptors and President (1999-2004) of The Society of Portrait Sculptors. The Medal is hand crafted by the leading sculpture foundry Pangolin Editions of Chalford, England. 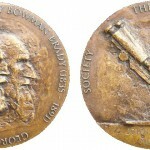 All nominations must be made on the TMS “Brady Medal” nomination pro-forma. Nominations must have a Proposer and Seconder, both of whom should be Members of the Society and not be affiliated to the same institute as the person they nominate. The completed nomination form should be returned to the Secretary of the Society. Nominations may be made at any time of the year. Nominations must be made in the strictest confidence and in no circumstance should the person nominated be informed. Presented annually to a young scientist in recognition of significant achievement in the field of applied and industrial micropalaeontology. Alan Charles Higgins (1936–2004), was a micropalaeontologist and expert on conodonts, who made major contributions to Palaeozoic biostratigraphy, and helped firmly establish the value of micropalaeontology in hydrocarbon exploration. He was the founding member of TMS, its past Chairman and Honorary Member. The Higgins Award is given to a young scientist, less than 10 years from graduation, in recognition of significant achievement in the field of applied and industrial micropalaeontology, as documented by publications, software, patents, leadership or educational activities. The award has been established with the help of Alan’s family and friends, to commemorate his contribution to micropalaeontology and to encourage young researchers in the field. It will be presented in person at the Society’s AGM in November, and one award will usually be made each year. The award has a value of £300, but more importantly, it is meant to serve as a substantive endorsement of the value of the recipient’s work, made by his peers. The first award was made in 2010. All nominations must be made on the following nomination pro-forma and submitted to the Secretary. Nominations can be made by any TMS member. The nominees need not be members of TMS. The award is normally given annually and resubmission of unsuccessful nominees is possible. Nominations must be received by the 28th February. Nominations must be made in the strictest confidence and in no circumstance should the person nominated be informed. The late Charles Downie was one of the pioneers of palynology in the U.K. and a mentor who guided the thinking and development of a large number of postgraduate students who passed through the University of Sheffield. Through the efforts of former colleagues at Sheffield, a permanent memorial has now been established to recognize Charles’ contribution to micropalaeontology. An annual award will be made to the society member, who in the opinion of the Committee, has published the most significant paper, in any journal, based upon his or her postgraduate research. The award of £200 is made for the best paper published during each year and will be presented at the society AGM in November. Nominations should be submitted either to the secretary of the appropriate Specialist Group, or the Secretary. The award is normally given annually. Nominations must be received by the 28th February. Nominations must be made in the strictest confidence and in no circumstance should the person nominated be informed. Subscriptions are welcome at any time; please send donations to the Treasurer. Dodsworth, P. 2000. Trans-atlantic dinoflagellate cyst stratigraphy across the Cenomanian-Turonian (Creataceaous) Stage Boundary. Journal of Micropalaeontology, 19, 69-84. Mullins, G. 2001. Acritarchs and prasinophyte algae of the Elton Group, Ludlow Series, of the type area. Monograph of the Palaeontographical Society, London, 155, 154pp. Blom, H, Märss, T. and Miller, G.C., 2002. Silurian and earliest Devonian Birkeniid anaspids from the Northern Hemisphere. Transactions of the Royal Society of Edinburgh: Earth Science, 92(3-4), 263-323. Martin A. Pearce, Ian Jarvis, Andrew R. H. Swan, Amanda M. Murphy, Bruce A. Tocher and W. Michael Edmunds, 2003. Integrating palynological and geochemical data in a new approach to palaeoecological studies: Upper Cretaceous of the Banterwick Barn Chalk borehole, Berkshire, UK. Marine Micropaleontology, 47 (3-4), 271-306. Schmidt, D.N., Thierstein, H.R., Bollmann, J. and Schiebel, R., 2004. Abiotic Forcing of Plankton Evolution in the Cenozoic. Science, 303, 207-210. Gibbs, S. J., Young, J. R., Bralower, T. J. & Shackleton, N. J., 2005. Nannofossil evolutionary events in the mid-Pliocene: an assessment of the degree of synchrony in the extinctions of Reticulofenestra pseudoumbilicus and Sphenolithus abies. Palaeogeography Palaeoclimatology Palaeoecology, 217, 155-172. Maddison, E. J., Pike, J., Leventer, A., Dunbar, R., Brachfeld, S., Domack, E. W., Manley, P. & McClennen, C., 2006. Post-glacial seasonal diatom record of the Mertz Glacier Polynya, East Antarctica. Marine Micropaleontology, 60, 66-88. Edgar, K. M., Wilson, P. A., Sexton, P. F. & Suganuma, Y. 2007. No extreme bipolar glaciation during the main Eocene calcite compensation shift, Nature 448, 908-911. Schweizer M., J. Pawlowski, T. J. Kouwenhoven, J. Guiard and B. van der Zwaan, 2008. Molecular phylogeny of Rotaliida (Foraminifera) based on complete small subunit rDNA sequences. Marine Micropaleontology, 66, 233-246. Dunkley Jones, T., Bown, P. R. and Pearson, P. N. 2009. Exceptionally well preserved upper Eocene to lower Oligocene calcareous nannofossils (Prymnesiophyceae) from the Pande Formation (Kilwa Group), Tanzania. Journal of Systematic Palaeontology, 7, 359–411. Tracy Aze (Cardiff University)Aze, T., Ezard, T.H.G., Purvis, A., Coxall, H.K., Stewart, D.R.M., Wade B.S. & Pearson P.N. A phylogeny of Cenozoic macroperforate planktonic foraminifera from fossil data. Biological Reviews 86, 900–927. Phillip E. Jardine (University of Birmingham)Jardine, P.E., Harrington, G.J. & Stidham, T.A. Regional-scale spatial heterogeneity in the late Paleoceneparatropical forests of the U.S. Gulf Coast. Paleobiology, 38(1), 15–39. Lyndsey R. Fox (University of Leeds)Fox, L.R. and Wade, B.S. 2013. Systematic taxonomy of early-middle Miocene planktonic foraminifera from the Equatorial Pacific Ocean: Integrated Ocean Drilling Program Site U1338. Journal of Foraminiferal Research 43, 374-405. Spectrometry. Geochimica et Cosmochimica Acta, 146, 90-106. Manuel Weinkauf (University Bremen) Weinkauf, M. F. G., Moller, T., Koch, M. C., Ku!era, M., 2014. Disruptive selection and bet-hedging in planktonic Foraminifera: Shell morphology as predictor of extinctions. Frontiers in Ecology and Evolution, 2, 64. doi: 10.3389/fevo.2014.00064. Sam Slater (University of Sheffield) Slater, S.M. and Wellman, C.H. 2015. A quantitative comparison of dispersed spore/pollen and plant megafossil assemblages from a Middle Jurassic plant bed from Yorkshire, UK. Paleobiology 41(4) 640-660. Honorary membership will be offered to those individuals who have, in the view of the committee, made an outstanding and sustained contribution to the Society. Honorary Members receive all the benefits of normal membership of the Society free of charge for life. In order to support the teaching of micropalaeontology at all BSc, MSc and equivalent levels, as well as to encourage and reward student engagement and achievement in this field, The Micropalaeontological Society announces the establishment of TMS Student Awards. Each award consists of 1 year free membership in the Society, including two issues of Journal of Micropalaeontology and Newsletter of Micropalaeontology, discount on TMS and GSPH publications, discounted registration fees at TMS specialist group meetings, eligibility for awards and grants-in-aid. The awards are given annually by tutors of micropalaeontology courses. Only one award per year per institution may be given. Nominating tutors must be members of TMS and they must send a brief description of the course to TMS Secretary, who will confirm in writing that the given course is approved for the award. The Secretary will keep a list of registered micropalaeontology courses, conferring with the Committee when necessary. Course tutors of registered courses may then give the award at any time of the year on the basis of any criteria to students deemed to have achieved meritorious grades. The tutor reports the name and address of the awardee, as well as a brief statement on the criteria used to select the awardee, to the Secretary, who will collate a list of citations to be tabled each year at the AGM and printed in the Newsletter. Information for Tutors: In order to register a micropalaeontology course at your institute, please fill in the form and send to Secretary. You only need to do this once, unless the course has changed or you wish to report a different course for the award scheme. Tutors are welcome to submit the form electronically. Anna Mikis (Cardiff University) -this award was made in memory of Brian O?Neill. Andrew Leighton (University of Plymouth) – this award was made in memory of Brian O’Neill. Multiple TMS travel grants of up to £100 are available to support postgraduate students and early career researchers (those who have completed their PhD within the last 5 yrs) to attend the TMS Annual Conference held in November each year. This grant can only be used to contribute towards travel and accommodation costs. Successful grant candidates must be presenting at the conference (oral or poster presentation). Please complete the application form below and return to the Events Secretary (events@tmsoc.org) before the 30th September in the year of the AGM that you wish to attend. Candidates will be notified of the status of their application in in early October. Grants-in-Aid are awarded annually to help student members and early career researchers (within 10 years of obtaining their last degree) of the Society in their fieldwork, conference attendance, or any other specific activity related to their research which has not been budgeted for. Grants-in-Aid can not be awarded for miscellaneous expenditure, neither can they be awarded retrospectively. The proposed activity must take place in the calendar year commencing the 1st April following the application deadline in February. A maximum of £500 can be awarded to each successful applicant. Awardees are expected to write a short report for the Newsletter once their grant has been used. For more information, please contact the Secretary. The deadline for applications is the 28th February. More info TMS Educational Trust Awards. This trust offers finacncial support for post-graduate training in micropalaeontology. An application form is available on the TMS Small Research Grant. An application form is available on the TMS Educational Trust Awards.